Formerly from museum exhibitions and their vaults, comes this display of rare swords, and sabers. Four are from the famous Norm Flayderman-Philip Medicus Collection. They appear in many authoritative books.Shown is the famous Ketland eagle head sword with pierced guard and Medicus tag. Very few silver hilt weapons have survived the American Revolution and the War of 1812. They are highly sought after by discriminating collectors. The most desirable were eagle heads swords made by Philadelphia silversmiths. Illustrated is a Philadelphia Eagle Head Saber, Ca 1805. We offer unique and rare nautical antique ship's binnacles, telegraphs, helms and other bridge gear, all in exceptional condition. They are the best of English and American makers from the early 1800's to the mid 20th Century. Shown is a rare three legged dolphin binnacle with mushroom hood and twin burners. Most of these nautical antiques are only seen in museums. In this group are very rare, nautical antique compasses and terrestrial sighting devices, some with features not seen in reference books or in museum collections. They are in superb condition or would not be offered. They are perfect for the collector or as a gift or for presentation. 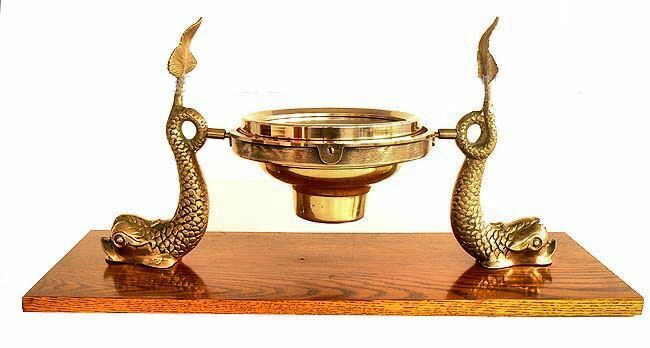 Shown is a D. Baker compass displayed with two antique brass dolphins. 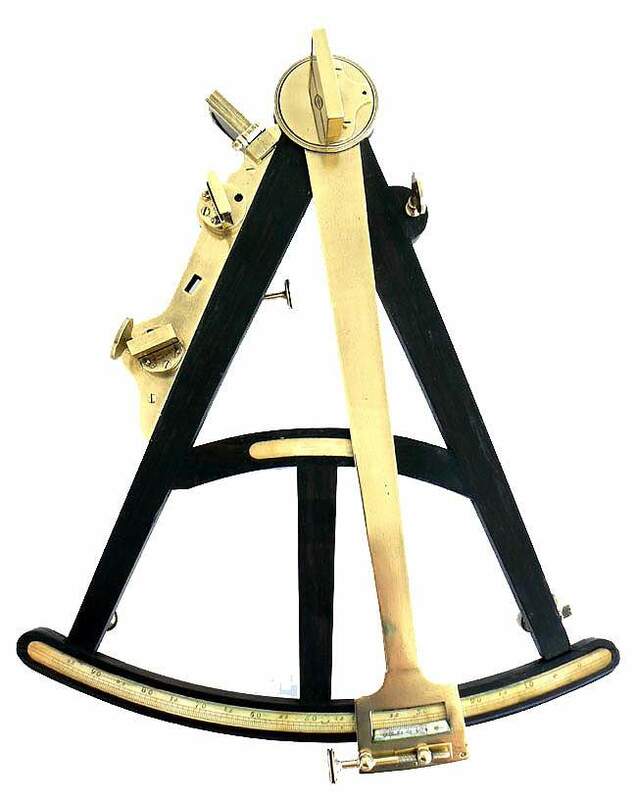 We specialize in high quality 19th Century instruments for celestial navigation and feature such American names as Stackpole, Blunt, Negus, and the English Hadley, Thoughton, Ramsden and the Spencers to name but a few. All have detailed descriptions and numerous high resolution photographs. This one is a Hadley style octant with a principal dimension of 16 inches. Early brass frame antique sextants of museum quality are frequently available. Here are antique naval weapons such as cutlasses, sabers, boarding axes, and pistols of the U.S. and Royal Navy. Also included are Civil War weapons of the Army. Shown is a first issue M1852 Naval Officer's sword by Horstmann. We offer only the rarest and highest quality antique edged weapons of this type. Many of them appear in authoritative research books. Shown are three of exceptional interest. The bottom one is a Ca 1790 U.S. Naval dirk of importance. 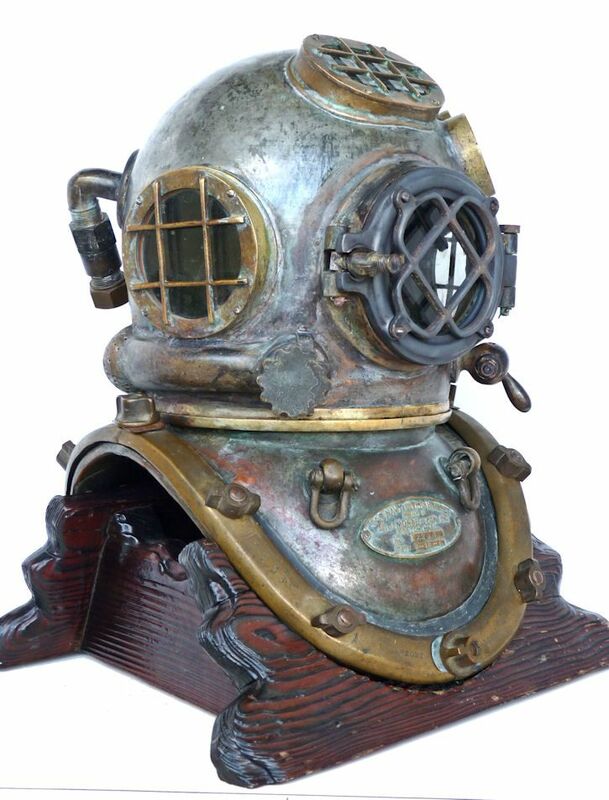 One of our sub-specialties is antique and vintage nautical diving helmets which are becoming another collectible in short supply. In January, 2013, we sold a Morse 1916 U.S. Navy MK V. It was one of 50 made in the first year of production. We now have a rare 1944 Miller-Dunn Navy MK V dive helmet available. A number of years ago, we sold a 1918 Schrader MK V which had been retrofitted to HeliOx around 1935. We are proud of finding these rare hard hat diving relics. We seek out miniature desktop ship's cannons and larger signal and salute cannons of the highest quality. These scarce nautical antique relics were made to commemorate a foundry's work or as a special gift. The photo is of a miniature ship's cannon dated 1755. In this group, you will discover rare antique models of the ship makers art from the 19th and early 20th Centuries. Our sip models are of the highest quality and capture the history and romance of the sea. 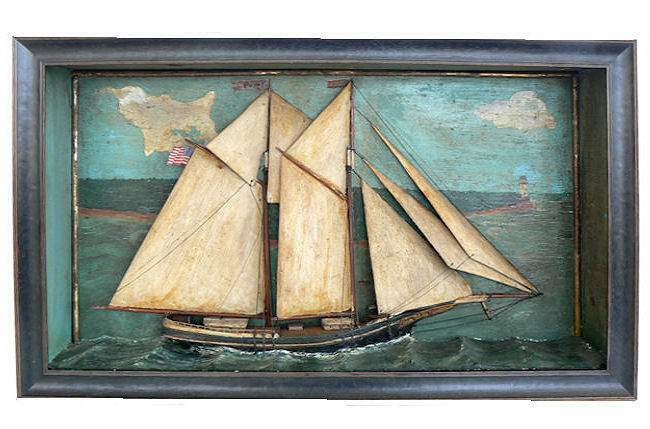 Illustrated is a diorama of an American coastal schooner of the 19th Century. Our collection of these relics of the Days of Sail consist of only authentic ship's figureheads and not the fiberglass or resin copies that are so prevalent on the internet and in most outlets claiming to sell nautical antiques. The reason the real ones are so scarce is because their use was discontinued at the time of the transition from Sail to Steam or over 100 years ago. Most of the survivors are now to be found only in museums throughout the world. 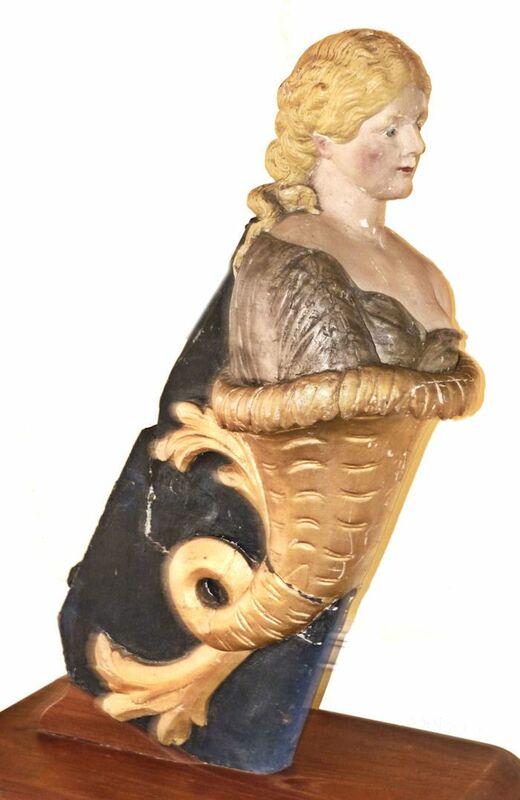 The figurehead pictured is from an American sailing yacht, Ca 1865 in a desirable smaller size. Nautical antique Half Models also known as half hull models are fascinating. They were used in ship building to loft the lines of a vessel, for presentation to the ship's owner, and by the yard to advertise their abilities. They also were used by the Navy for study and as a record of the ship's construction. 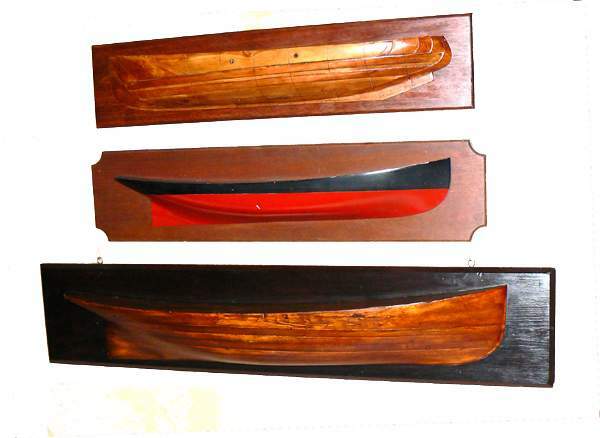 Shown are three models of various types of hulls. Offered are rare U.S. Navy artifacts such as a USS WASP telegraph and a relic from the USS MAINE, with bells, telegraphs, and chronometers, all of which are authentic and in superb condition. Worthy British Royal Navy items included. 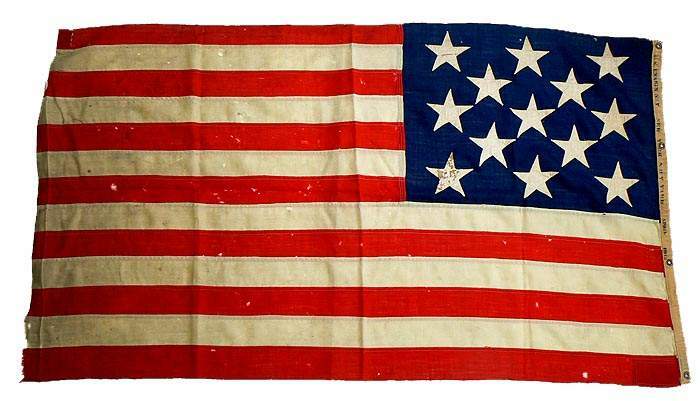 13 Star US Navy flag was first insignia on a Naval aircraft. We have a sub-specialty in Royal Navy officer uniforms and historic service medals of the 18th and 19th Centuries. The medals trace Britain's Rule of the Oceans from 1793 foreward. Few of these medals have survived and in some actions very few were awarded. 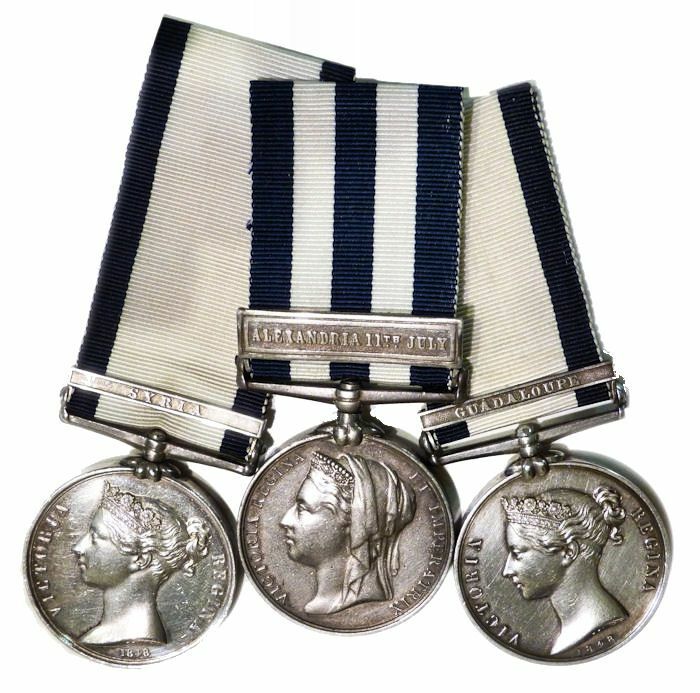 Three Naval General Service medals are pictured. The rarest is from the Battle of Guadeloupe in 1810 of which only 484 were issued. 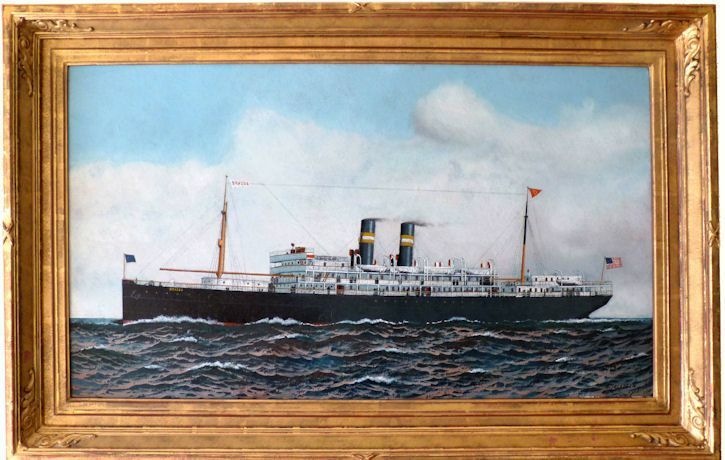 Fine quality marine art from world renown artists will be found at affordable prices. Representative artists are those of the 18th, 19th and 20th Centuries. Also authentic nautical antique wood carvings including figureheads and Bellamy eagles, British Woollies and other forms of the sailor's art. Artists represented range from the known like Edward Moran to the unknown, but brilliant watercolorist of ship portraits, H. Fletcher. Shown at left is SS BRAZOS by Jacobsen. All our bells are authentic nautical antiques. You will find the central focus is on those of the U.S. Navy from WW II and earlier. Navy bells have become a very scarce commodity. Pictured is a Turn of the 20th Century Navy foredeck or anchor bell with rustic natural patina. Our ship's clocks are arguably the finest and are guaranteed to be running on arrival. 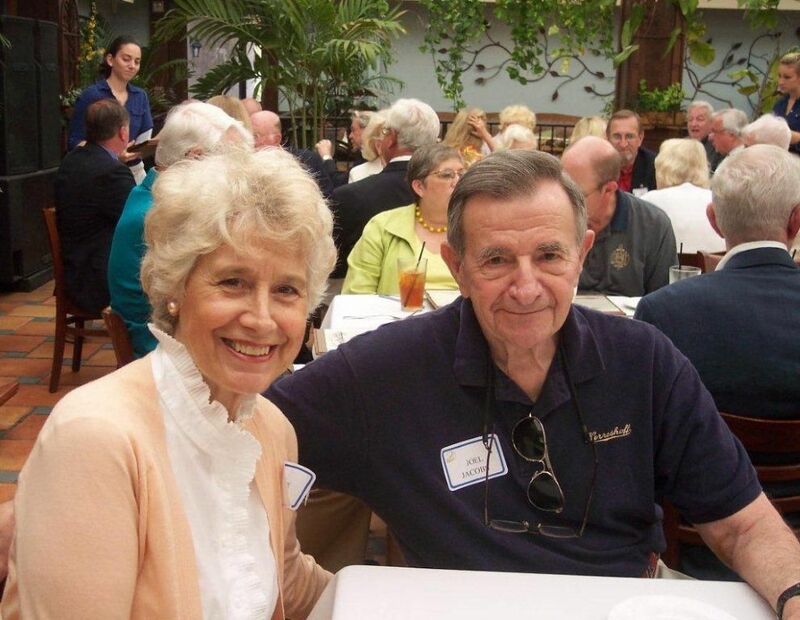 They are from Chelsea, Seth Thomas, and Howard and date from WWII and earlier. 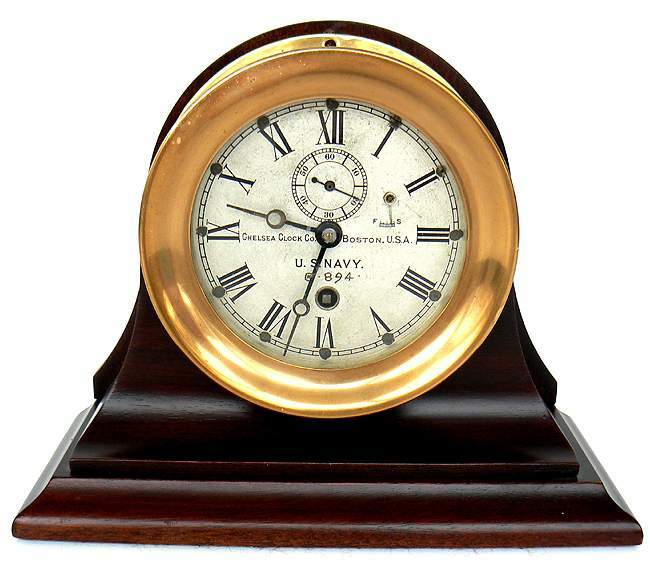 Shown is a very rare early Chelsea U.S. Navy clock from 1897. Early marine clocks are becoming recognized as a form of marine art. 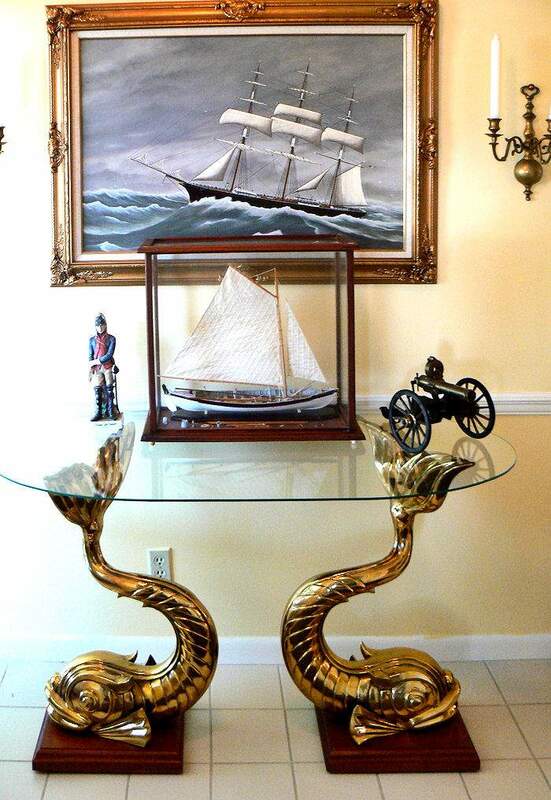 We are the source of fine, authentic, nautical antiques and marine art for homes and offices of distinction. They come from furnishings used on ships as well as pieces handcrafted for a specific purpose such as campaign furniture. Many are one-of-a-kind. The grouping shown is only a sampling. 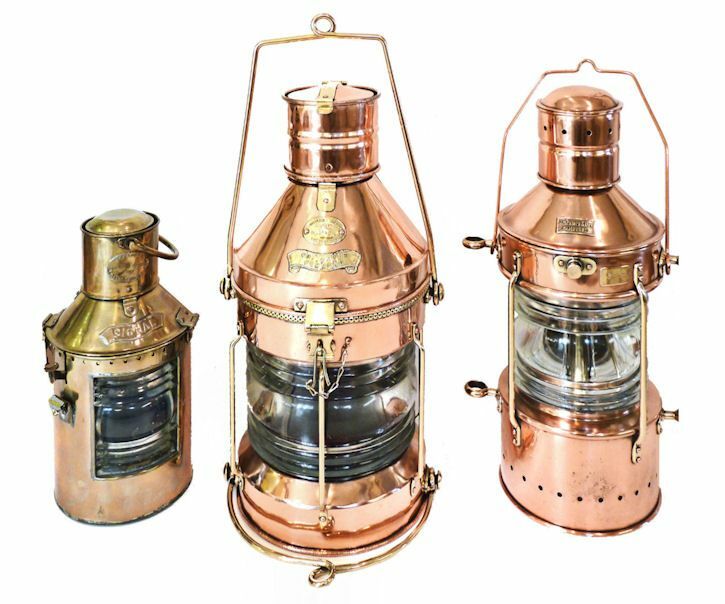 We specialize in rare, high quality 19th Century ships navigation lamps in polished brass and copper and iron. They feature American names such as PERKO, National Marine Lamp, important British makers, and other early makers. Look for unique British anchor lights like the 25 inch GIANT center one pictured and the 19 inch light to the right. VINTAGE OUTBOARD MOTORS RECONDITIONED FOR DISPLAY. 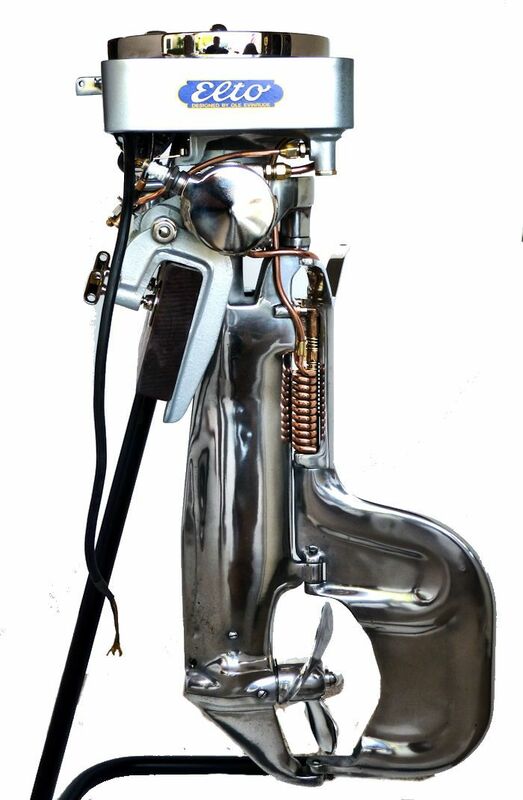 We are the source for high quality outboard motors that make very special retro decor pieces. They have been dismantled, cleaned, polished and reassembled with fresh decals and with extraordinary attention to detail. They are not intended to be run, but to be viewed and enjoyed as marine Folk Art. The one pictured is a 1924 ELTO Light Rudder Twin in museum condition. Our extensive background and knowledge of celestial navigation makes us a prime source for Pre-owned contemporary Marine Sextants. We only offer the best examples or "Collector Quality" sextants such as the C. Plath Navistar Classic, the finest contemporary available in limited quantities. 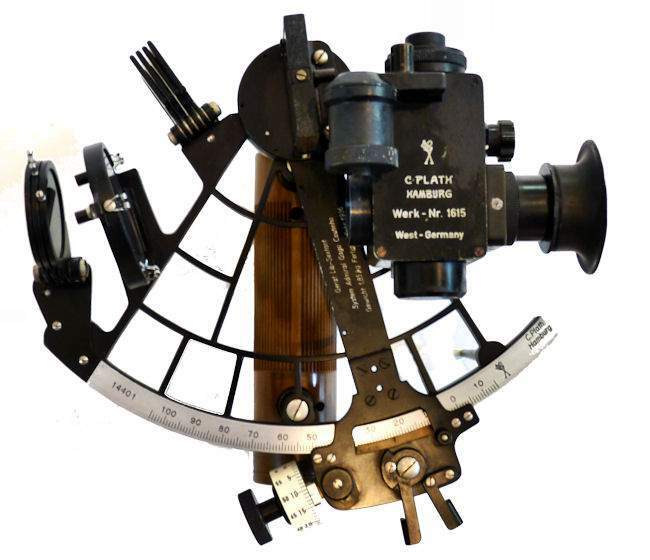 Pictured is a famous Plath Admiral Cago Coutinho aircraft sextant dated 1936 currently for sale. It is shown with a later artificial horizon. These are the finest aircraft models made. They include WW I fighter planes, and historic commercial airliners. Each is made like the real aircraft using frames, ribs and stringers covered with silk and painted in original colors with the correct emblems. The attention to detail and reasonable prices will satisfy the most demanding aficionado. Shown is a Boeing 314 Clipper. Consigning is a great way to dispose of your nautical antiques and marine art, and receive the maximum possible price. We do all the work and have a worldwide reach combined with a proven track record over a ten year period of achievement. Read about how we can exceed your expectations. Selling to us is also explained and easy to do. A SPECIAL NOTE: We have both a Navy, Maritime and Aviation Industry background which enables us to search out hard-to-find items of an unusual nature which we make available at fair and honest prices backed by our reputation for fair dealing. As collectors of marine art, nautical antiques, vintage ship, boat and plane models we have an eye for beauty and value, and enjoy passing our knowledge on to our customers. Some of our past and present memberships include the: Association of Naval Aviation, Silver Wings, The Tailhook Association, United States Naval Academy Alumni Association Associate, Naval Academy Sailing Squadron, McCampbell's Aces Squadron, The Nautical Research Guild, Naval Historical Foundation, the Naval Order of the United States, and the Historical Diving Society - USA. VISA AND MASTER CARD CUSTOMERS CAN SHOP FROM THIS SITE USING THE PAYPAL ICON AND THEIR CREDIT CARD. NOTHING ELSE IS REQUIRED. International buyers welcome, but inquire first. We have satisfied customers in Argentina, Australia, Austria, Belgium, Bermuda, British Virgin Islands, Canada, Chile, China, Cyprus, Czech Republic, Democratic Republic of Congo, Denmark, Estonia, England, France, Germany, Greece, Holland, Hong Kong, Hungary, Iceland, Indonesia, Ireland, Israel, Italy, Japan, Kuwait, Latvia, Luxembourg, Malaysia, Malta, Martinique, Mexico, New Hebrides (Vanuatu), New Zealand, Nigeria, Norway, Nova Scotia, Panama, Philippines, Poland, Portugal, Puerto Rico, Romania, Russia, Saudi Arabia, Scotland, Singapore, South Africa, Spain, Sweden, Switzerland, Thailand, Turkey, United Arab Emirates, USVI, Vanuatu (New Hebrides) and the Eastern Caribbean. Email us for details because there are some extra processing costs in sending international shipments. OUR UNCONDITIONAL NO NONSENSE GUARANTEE: For products other than sextants*, if not completely satisfied with your purchase it may be returned within five days of receipt in its original packaging if without damage. Return items must be insured for their full value. Only a prior email authorization from us for the return is required. Shipping charges are included in this offer within the continental United States if an error is due to our fault. * Please see guarantee under new, and previously owned sextants which varies bewteen the two and our other products. We sell high quality products, at fair and honest prices, and back them by old fashioned customer service. That's not a catchy slogan, its a fact. for information, detailed descriptions and prices of our items. This number is for customers. If you have things for sale or want additional information, please use an email!